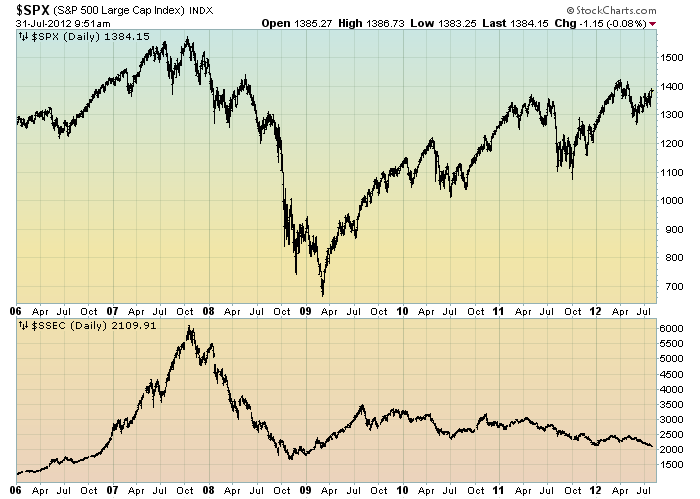 Starting on May 3, 2010 I have written posts concerning the notable divergence that has occurred between the S&P500 and Chinese (Shanghai Composite) stock markets. It is notable that the Shanghai Composite led the SPX (S&P500) significantly in late ’08 – early ’09, yet it has been (gradually) declining since that time. I continue to find this divergence between the S&P500 and Shanghai Composite to be notable and disconcerting, on an “all things considered” basis. This entry was posted in Investor, Stock Market and tagged S&P500, Shanghai Stock Exchange Composite Index, Stock Market on July 31, 2012 by Ted Kavadas. 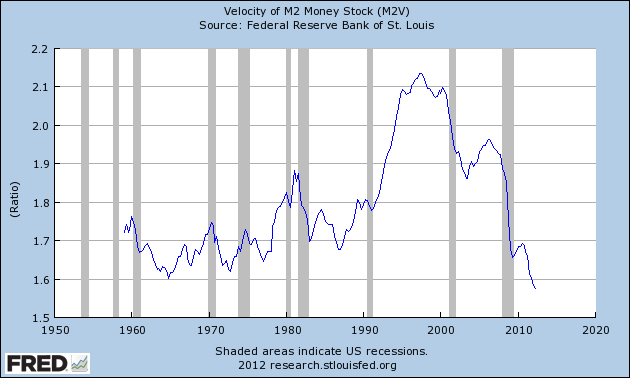 Here are three charts from the St. Louis Fed depicting the velocity of money in terms of the MZM, M1 and M2 money supply measures. 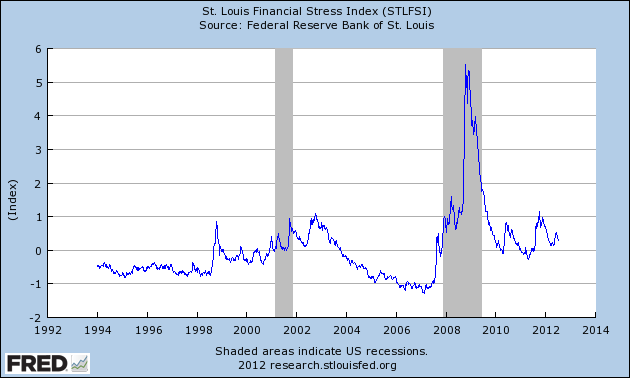 This entry was posted in Uncategorized and tagged economic indicators on July 29, 2012 by Ted Kavadas. The movement of the ECRI WLI and WLI, Gr. is particularly notable at this time, as ECRI publicly announced on September 30, 2011 that the U.S. was “tipping into recession,” and ECRI has reaffirmed that view since, most recently in a Bloomberg interview of July 10 titled “Recession Here” in which Lakshman Achuthan argues that the U.S. is now in a recession. Below are three long-term charts, from Doug Short’s blog post of July 27 titled “ECRI Recession Call: Weekly Leading Index Improves.” These charts are on a weekly basis through the July 27 release, indicating data through July 20. 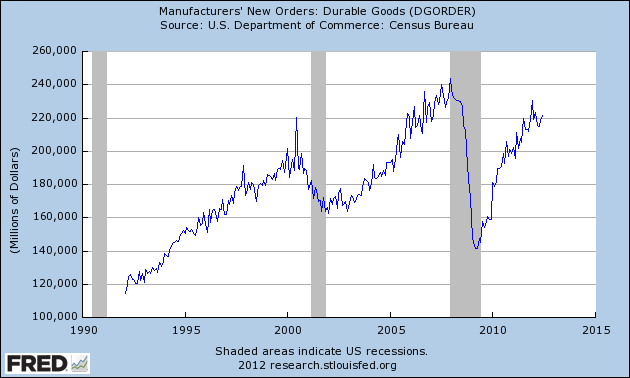 This entry was posted in Economic Forecasts and tagged ECRI on July 28, 2012 by Ted Kavadas. This entry was posted in Economic Forecasts and tagged Economic Forecasts, economic indicators, STLFSI on July 27, 2012 by Ted Kavadas. 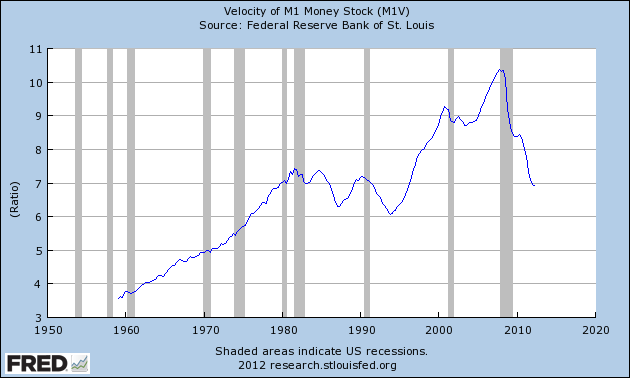 This entry was posted in Uncategorized and tagged economic indicators on July 27, 2012 by Ted Kavadas. 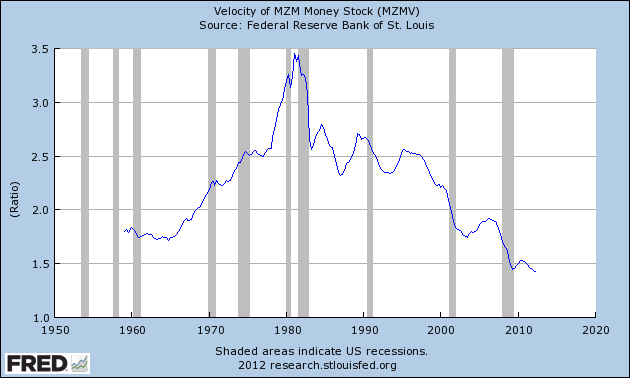 In previous posts I have discussed the Bond Bubble and its many facets. Since my last post on the Bond Bubble (the February 21 post titled “The Bond Bubble – February 2012 Update“) yields of various Treasury maturities have continued to decline and many have been establishing all-time lows in the last few days. Many investors, including those very prominent, currently believe that the biggest threat to the future value of bonds is inflation. While I believe that the threat of inflation is a concern, there are various other factors that pose immense threats as well. While this Bond Bubble may have a little more “upside” left to it, I am of the belief that attempting to derive gains from bonds at this point is akin to “picking up pennies in front of a steamroller” – i.e. there is little to be gained, and much to be lost. While the Bond Bubble continues, its risks to investors, financial markets and the economy in general has in no way diminished. Falling interest rates over the last 20 years have been an “enabler” of much of our current day economy. This entry was posted in Bubbles (Asset) and tagged asset bubbles, bond bubble, bubbles, U.S. Treasuries on July 25, 2012 by Ted Kavadas. The July update of the USA TODAY/IHS Global Insight Economic Outlook Index shows real GDP growth, at a six-month annualized growth rate, slowing to 1.6% in July and then increasing to 2% by year end. While employment, housing (mostly the multifamily sector) and consumer spending are slowly recovering, concerns about the Eurozone and world growth continue. As of 7/20/12 (incorporating data through 7/13/12) the WLI was at 121.9 and the WLI, Gr. was at -2.3%. 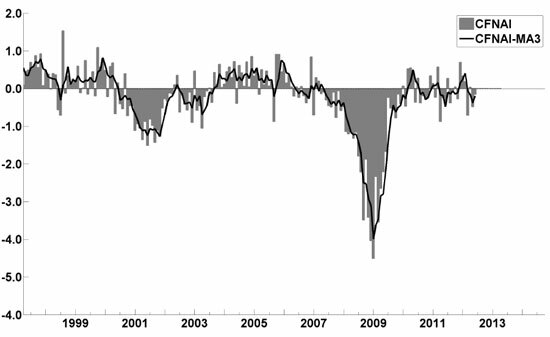 As per the July 19 release, the LEI was at 95.6 and the CEI was at 104.5 in June. 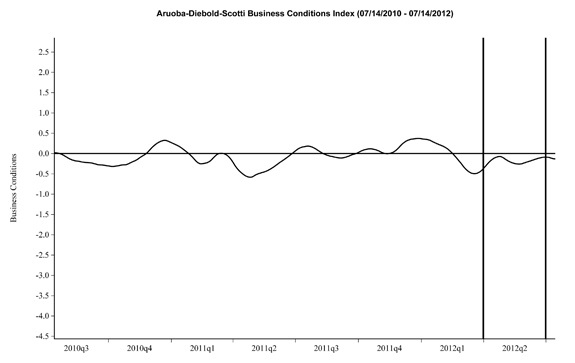 This entry was posted in Economic Forecasts and tagged ADS Index, Aruoba-Diebold-Scotti Business Conditions Index, Chicago Fed National Activity Index, Conference Board CEI, Conference Board LEI, economic forecasting, economic indicators, ECRI, USA Today / IHS Global Insight Economic Outlook Index on July 23, 2012 by Ted Kavadas. Below are three long-term charts, from Doug Short’s blog post of July 20 titled “ECRI Recession Call: Weekly Leading Index Declines.” These charts are on a weekly basis through the July 20 release, indicating data through July 13. 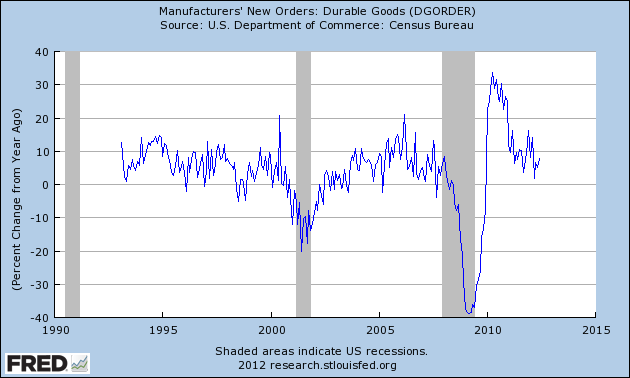 This entry was posted in Economic Forecasts and tagged ECRI on July 21, 2012 by Ted Kavadas. This entry was posted in Economic Forecasts and tagged Economic Forecasts, economic indicators, STLFSI on July 20, 2012 by Ted Kavadas. In the March 9, 2012 post (“Charts of Equities’ Performance Since March 9, 2009 And January 1, 1980“) I highlighted two charts for reference purposes. This entry was posted in Stock Market and tagged S&P500, Stock Market on July 18, 2012 by Ted Kavadas.